Eco-friendly isn’t usually the first word that pops into your mind when you think ‘Cinco De Mayo,’ but it can be this year. With a few simple swaps you could be throwing an incredible eco-friendly Cinco De Mayo celebration. It doesn’t take a lot of effort, but it will make a big impact. First, consider throwing a potluck or barbecue. Potlucks are more environmentally friendly as everyone is bringing something they made in a reusable container, therefore creating very little waste. Barbecues are also friendly on the environment for their low use of energy, if the correct fuel is used. Lump charcoal, propane, or an electric or solar grill are all better choices than charcoal briquettes and lighter fluid. Plus, cooking outside rather than in the kitchen helps to prevent your house from heating up and requiring the air conditioner to be run. Or, instead of cooking, bring home entrees for your fiesta from a restaurant. This is easily made eco-friendly if you bring your own containers, or use foil pans that can be recycled after use. After deciding what kind of celebration you’ll be having, it’s time to purchase the food. Visit a farmers market first, for locally grown fresh produce and then head to the grocery store. Remember to bring your own bags, and select locally grown and/or organic items whenever possible. You can also take your celebration one step further, and make it meatless. Whether you have a potluck, barbecue, or traditional fiesta, all can be made environmentally friendly by excluding meat. Meat not only has a much higher carbon footprint than vegetables, but also requires a lot more water to produce. And with so many delicious meat-free alternatives, its absence will hardly be missed. Serve options such as veggie fajitas, grilled veggie burritos, grilled pizza, cold pasta and potato salads, fruit salad, veggie burgers, bean and cheese dip, cheese enchiladas or tamales, nachos, etc. When it comes to drinking, ask your guests to avoid stuffing anything, like a slice of fruit or used napkin, inside their bottle or can. This makes the bottle or can unable to be recycled, as it requires too much effort to extract whatever has been put inside. Also ask guests to put their recyclables in specially marked trashcans to be recycled later. But before that, you’ll need to actually invite your guests. One of the easiest ways to do that, and go green for Cinco De Mayo, is to invite guests via Evite, rather than posting paper invites through the mail. Purchasing and making eco-friendly party supplies is just as easy. Use real or compostable plates, cups, and utensils instead of plastic ones. Also select cloth table cloths and napkins, or those made of recycled materials. Rather than purchasing a pinata, why not try making one out of paper bags (which can be recycled when the party is over)? 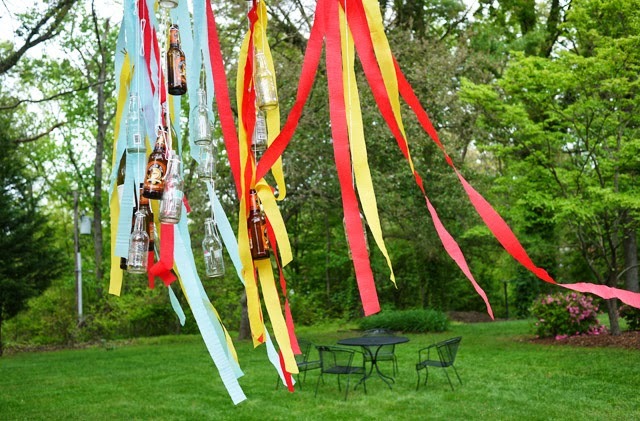 Or make a colorful banner out of felt or cloth to decorate the space with. Also consider decorating with items like maracas and sombreros, or using brightly colored table cloths, cups and plates. Lastly, encourage your guests to carpool to the celebration and, especially if alcohol is served, to share a cab home. With a few simple swaps, you can have a colorful and delicious eco-friendly Cinco De Mayo celebration this Saturday. Just remember to recycle and pick up any trash left behind. Happy Cinco De Mayo!